Hart District Council has launched a new online lottery, the Hart Lottery, to benefit good causes in Hart by providing a great way to raise additional funds. Players also have the option of choosing the Hart Community Fund when they buy a ticket. The Councils Cabinet has agreed that money from this fund will be distributed on an annual basis between the Chairman's charities for that year. The charities for 2017/18 which may be eligible for these funds can be viewed at www.hart.gov.uk/chairman-council-2017. You can buy tickets and support your local good cause at www.hartlottery.co.uk. The Lottery is free for good causes to join and applications to benefit from the lottery can be made now at www.hartlottery.co.uk. An Information pack for good causes can be found here and further background information can be found on this presentation. There are a set of criteria which local good causes must meet to be a part of the Lottery. These can be found here. Since launching in July 2017, the Hart Lottery has over 45 good causes residents can choose from, to support when buying their lottery tickets. Two good causes that have received the most support so far are Aspire Gymnastics at Frogmore and Calthorpe Park School Association. Click on the charities below to see how the Hart Lottery is helping them raise funds. 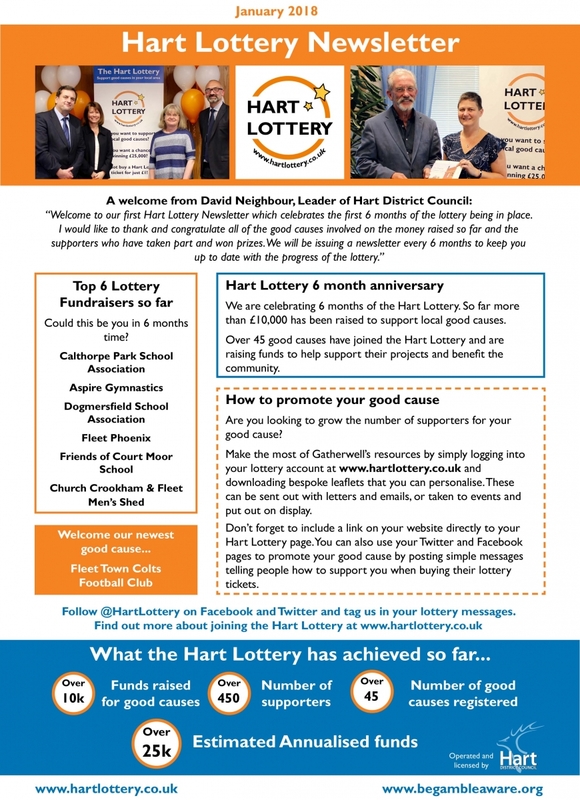 The Hart Lottery newsletter will be issued every 6 months to keep good causes up to date with the progress of the lottery. If you have any questions please get in touch by emailing support@hartlottery.co.uk‌.